I have a love-hate relationship with sweet potato fries. I enjoy them when they’re done right–crispy on the outside, soft inside, and seasoned well. But I seriously despise them when they’re done poorly–soggy, bland, and chewy. Sweet potato fries are hard to nail and I will be the first to admit that I land amongst the poor SPF executers. Until this batch, that is. The key for me was using a cooling rack on top of the baking sheet. Elevating the fries allows them to cook evenly from all angles, rather than having to flip them halfway through, crossing your fingers you’ll get the same crispiness on each side (which never happens, btw). I don’t think I’ve fully reached the pro SPF executers club, but I am much, much closer. If you don’t have a cooling rack, talk about desperately wanting one in front of your best friend, family members, or significant other until someone finally buys you one to make you shut up. Not saying I did that, but it’ll probably work. Okay, I did that. Thanks again, Carissa! Preheat oven to 450 degrees. Cut up potatoes into 1/4 inch slices. You can choose to leave the skin on or peel the potatoes before cutting them up. Generally, I like to keep the skin on, but I peeled them here. Toss the sliced potatoes and seasonings in a bowl with olive oil to coat. Be liberal with your seasonings as sweet potatoes have a very strong flavor that can be over powering if not seasoned well. Arrange the potatoes on a cooling rack on top of a baking sheet, evenly spaced apart. Pop in the oven and cook for 30-40 minutes, until the outside is crispy and the inside is soft and fluffy. I turned the baking sheet 180 degrees halfway through to ensure an even cook. While the fries are cooking, make the aioli by combining all ingredients to taste. You can use any hot sauce you want. I used Cholula here, but Sriracha, Tapatio, and Crystal are some of my other favorites. When the fries are done, sprinkle with sea salt and serve with the aioli. 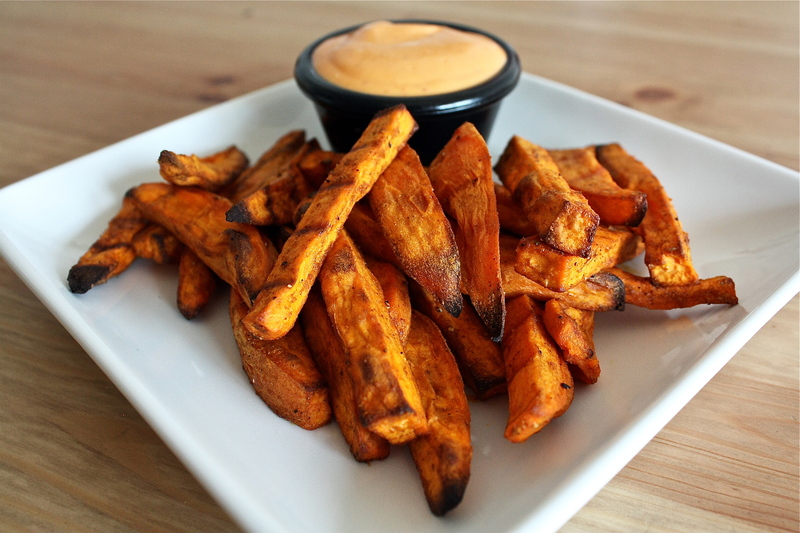 Sweet potato fries are definitely a weekends! Just seeing this I now will crave them until I finally give in and make them! Thank goodness you kept trying – because I stopped and often bought frozen ones (organic of course – is that a saving grace?). So, my dear daughter, I will try your cooling rack trick and let you know. I also just used that same idea when I made “baked fried” chicken to keep it crispy and it worked great!